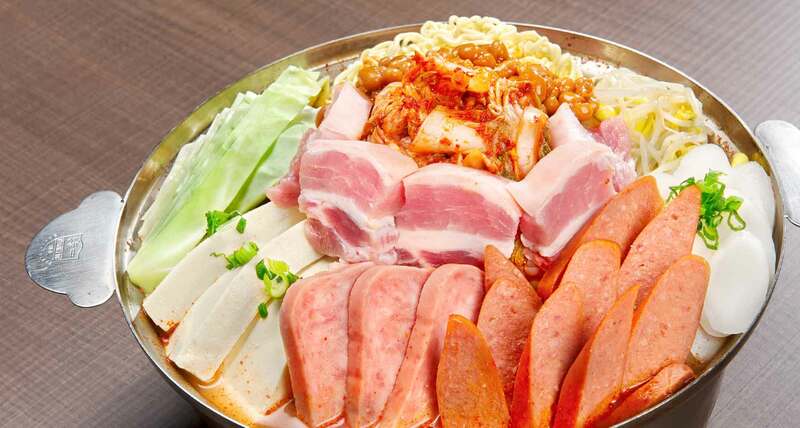 Korean Army Hot Pot, a.k.a Budae-Jjigae, was born during the U.S. occupation of Korea during the Korean War, when the locals were introduced to such American delicacies as Spam and sausages. They ended up making this utterly tasty mishmash of Korean and American foods, starring assorted meats backed up by kimchi, ramen noodles, tofu, and more. The basic principle behind Korean Army Hot Pot is that it can have all sorts of crazy ingredients, including cans of baked beans, Vienna sausages, Kraft cheese slices, rice cakes, bacon—basically, whatever you’re able to rustle up. It’s a cacophony of spice, meat, and umami. Simply excellent when you enjoy soju and beer! Foodies, visit SURA Korean BBQ to taste this awesomeness with your loved ones today! Click HERE to view our Korean Army Hot Pot on our menu.